Beijing will replace 80 percent of its buses with new-energy and clean-fuel vehicles by the end of 2017 in an attempt to reduce vehicle emissions and ease pollution. 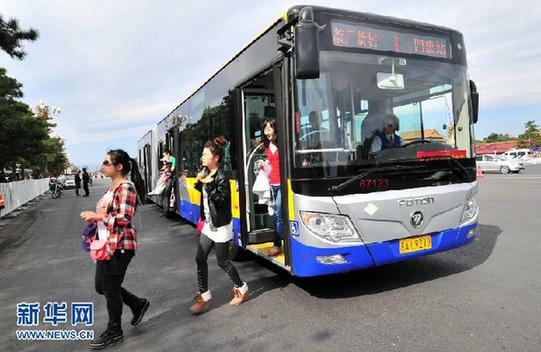 A total of 13,825 buses, including 4,058 electrically powered and 7,185 running on natural gas, will replace gas and diesel, the Beijing Commission of Transport said on Thursday. The commission has also pledged to further develop bus routes and sway more commuters using private cars to use public transportation. "The aim is to continuously reduce automobile emissions in downtown areas of the capital, while easing traffic congestion," said Wang Hao, an official with the commission's transport bureau. The commission estimates that by the end of 2017, the city will have 65 percent of its buses powered by clean energy, with 20 percent of them fueled by electricity and 50 percent by natural gas. The State-owned Beijing Public Transport Holdings will replace more than 10 routes operated by diesel-powered buses with more than 4,700 electric buses by 2017. "We will replace all buses running within the Fifth Ring Road with clean-energy buses within four years," Wang said. Nan Tao, head of the bus company's service bureau, said replacing traditional buses with clean-energy vehicles will reduce fuel consumption by 150,000 tons a year. Nitrogen dioxide emissions will fall by 50 percent and particulate matter by 60 percent, he said. According to Beijing's clean air action plan, the capital will upgrade more than 700 electric vehicles and 1,950 fueled by natural gas by 2014, while reducing the intensity of auto emissions by half by 2017. Wu Di, an official with the Beijing Environmental Protection Bureau, said the switch to clean energy in public transportation will bring a huge improvement to the city's air quality. Trolley buses, which took a back seat following a rapid rise in the number of gas- and diesel-fueled buses have come under the spotlight recently, with significantly more of the vehicles planned to hit Beijing's roads in coming years. Wu Yongzhi, deputy head of the bus company's technology department, said the capital currently has about 590 trolley buses, with 15 routes covering more than 200 km. Xu Kangming, a transport expert and founder of 3E Transportation Systems, said that when it is widely introduced the trolley bus will be very effective in combating pollution and easing traffic congestion. "With little noise, zero emissions and a low cost to maintain and operate, the trolley bus has proved to be efficient worldwide in protecting the environment," he said. Xu added that the trolley bus also has an advantage over wholly electric-powered buses, which require many charging stations on limited land resources in the capital. The batteries on these buses also have a short life, making them far more expensive to run than gasoline and diesel vehicles. Xu said that more than 25 cities in China used to run trolley buses, but many stopped doing so, and they are now operated in less than 10 cities, including Beijing, Guangzhou, Shanghai, Wuhan and Jinan.